Windows Vista 32 and 64-Bit, 2000, XP, Windows Server 2003 ONLY! NOT FOR MAC! The SS-2EXP is the most powerful Serial ATA II controller to accommodate Serial ATA II devices for a notebook computer. It also supports devices over SATA2 Port Multipliers. 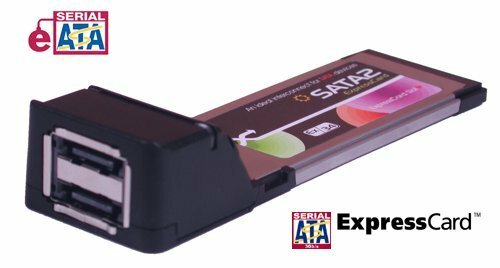 Any system with an ExpressCard interface can simply add the Serial ATA devices by simply adding the SS-2EXP controller card and loading the drivers into the system. Serial ATA is a high-speed serial link replacement for the parallel ATA attachment of mass storage devices. The serial link employed is a high-speed differential layer that utilizes gigabit technology and 8b/10b encoding. The current data rate is 1.5Gb/s (=150MB/s) and 3.0Gb/s. It will supports 6Gb/s in the future. The SS-2EXP supports two serial ATA ports, it supports 2 serial ATA devices (one for each) or can connect more devices via SATA2 Port Multipliers. It provides complete software drivers for most of the major operating systems. It is the right choice for a ExpressCard bus to Serial ATA versatile devices. Two serial ATA ports which fully support devices up to 3.0Gb/s transfer rate.